Barack Obama has made his pitch for a second White House term, pleading in his keynote address to the Democratic convention for more time in spite of the slow economic recovery and warning of the dangers posed by a Mitt Romney presidency. Employing sombre pragmatism in place of the soaring optimism of the 2008 campaign, heÂ told 23,000 people in the arena in Charlotte, North Carolina, and the tens of millions watching at home: “I won’t pretend the path I’m offering is quick or easy. “You didn’t elect me to tell you what you wanted to hear. You elected me to tell you the truth. And the truth is it will take more than a few years for us to solve challenges that have built up over decades. Throughout the week Obama campaign officials had been briefing that he would lay out a “roadmap” for the next four years to secure economic recovery. He did hold out the prospect of a program that would reverse US decline, hinting at embarking on an ambitious and bold Franklin Roosevelt-style New Deal if re-elected. But he failed to offer much in the way of detail, focusing instead on telling the activists in the hall and the millions watching at home that it was up to them to choose which future they wanted for the country. 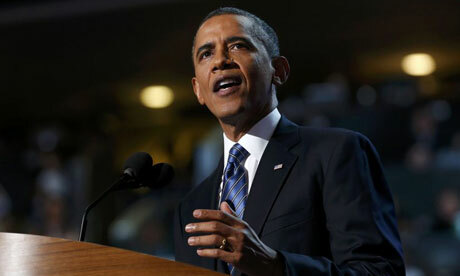 Obama’s formal acceptance of the party’s nomination to face Romney for the White House on 6 November was greeted with deafening applause from delegates. The speech had been moved from a 73,000-seater football stadium to the much smaller Time Warner Cable arena, leavingÂ disappointed ticket-holders, mainly party volunteers, to line up for seats at a screening in the nearby convention centre. The thunderstorms that party officials had cited as the reason for the venue change failed to materialise. The tone of Obama’s message â€“ delivered a few hours before the release of the latest monthly job figures â€“ was subdued compared with the sense of euphoria he created at the Denver convention four years ago. He also struck a very different note from Bill Clinton the night before. The more sober approach was deliberate, a recognition of the mood of disenchantment among some voters, tired of fine oratory and and more interested in his plans for a second term. Over the course of the 47-minute speech there were occasional flashes of the old idealistic language. “If you turn away now â€“ if you buy into the cynicism that the change we fought for isn’t possible â€¦ well, change will not happen,” he pleaded. He portrayed the election as the most important facing the US for generations, offering a clear choice between those who wanted a government actively engaged in trying to make life better, the Democratic view, and those who favoured small government, the Republicans. “When all is said and done â€“ when you pick up that ballot to vote â€“ you will face the clearest choice of any time in a generation. Over the next few years big decisions will be made in Washington, on jobs and the economy; taxes and deficits; energy and education; war and peace. Decisions that will have a huge impact on our lives and our children’s lives for decades to come. Though the main focus of the speech was the economy, Obama delivered an extremely effective swipe at Mitt Romney and Paul Ryan’s inexperience over foreign policy. “My opponent and his running mate are new to foreign policy, but from all that we’ve seen and heard they want to take us back to an era of blustering and blundering that cost America so dearly,” he said. Drawing parallels between his goals and those of FDR, he said the kind of America he wanted to create would take more than a few years to achieve. “It will require common effort, shared responsibility and the kind of bold, persistent experimentation that Franklin Roosevelt pursued during the only crisis worse than this one,” he said. Obama promised to create a million new manufacturing jobs by the end of 2016. The president also promised to double exports by the end of 2014 and cut net oil imports in half by 2020. The reaction among Democrats was less ecstatic than the reception they accorded to Clinton or even Obama’s wife, Michelle, on Tuesday night. James Carville, a Democratic strategist, described the speech as “muscular”. The final night of the convention had a Hollywood flavour with speeches by Scarlett Johansson and the Desperate Housewives start Eva Longoria. There were also emotional moments, with the delegates rising to their feet to welcome to the platform Gabby Giffords, the former congresswoman recovering after being shot in the head in an assassination attempt in Arizona last year. One of the strongest speeches came from John Kerry, lambasting Romney for his lack of experience or knowledge of foreign policy. A teary-eyed Joe Biden also accepted the nomination to stand again for the vice-presidency with a speech heavy on auto bailouts and the killing of Osama Bin Laden, designed to appeal to wavering white working class male voters who supported Obama last time. The Democrats paraded Charlie Crist, the former Republican governor of Florida, as evidence that the Tea Party-infused Republican party had become so extreme that moderates such as Crist had been forced out.